Learn all about the author of The Spreadsheet Guru website and discover what separates this Excel, PowerPoint, & MS Word blog from the rest! Who Is This “Spreadsheet Guru” Guy? Hello! My name is Chris Newman and I'm so excited you stumbled across this site! I am a 29 year old financial analyst based in Columbus, Ohio and am currently on a mission to share my knowledge of Excel and the rest of Microsoft's Office Suite to an online community that has taught me so much over the years. When I graduated from college back in 2011, I knew very little about the importance of Excel and the dependency businesses have on the Microsoft Office programs every single day. Early on in my career I came to the realization that there is a HUGE need for advanced Excel users in the business world. I decided right then and there to learn everything I could about the program's vast capabilities. I soon evolved from being an ordinary user into my company's leading Office expert and eventually my superiors nicknamed me “Chris Macro” due to my ability to automate tasks with VBA. After dedicating much of my time to absorbing the Microsoft Office Suite's capabilities, I am ready to pass on the knowledge I have acquired. My hope is to provide the best resources on the web for new and advanced Microsoft Office users. I enjoy any opportunity to hear feedback about the site so please feel free to contact me via any of my social network profiles by clicking any of the icons below! 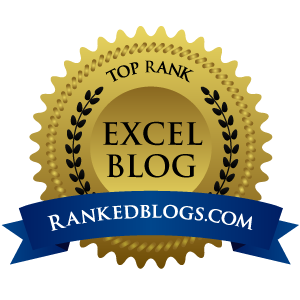 You can learn more about my professional career and how I was able to become a Spreadsheet Guru in my own workplace by listening to a podcast episode I was recently on. I share the journey I took early on in my career and also some of my favorite tips & strategies for learning Excel in a shorter amount of time. You can listen to it below or visit the official Podcast Page which includes show notes. In July 2016, I was awarded the Microsoft MVP (most valuable professional) award for the Excel program. 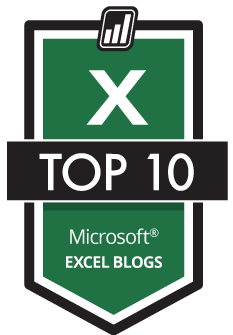 This was a great honor and I am grateful my work within the Excel community has made enough of an impact to warrant such recognition. If you would like to learn more about this achievement you can read my blog post announcing my award. UPDATE: I also received the Microsoft MVP award for 2017 & 2018! This website was created for the sole purpose of turning you into your office's resident "Spreadsheet Guru". I was able to do this in less than two years at my place of work and it has paid its dividends immensely ever since. So what does being a Spreadsheet Guru actually mean? My goal is to show you how to accomplish these four bullet points in the simplest and most straightforward manner possible. Becoming a Spreadsheet Guru does not mean you need to be the smartest guy in the room (I, in no way would categorize myself as a brainiac), but it does mean people need to VIEW you as one of the smartest guys in the room! This viewpoint makes you a valued asset and makes it much harder (in their minds) to lose you to another company. The MAJORITY of Microsoft Office users don't take the time to learn how to become what I like to call an "advanced" user with the software. Learning these more advanced skills will make you a highly valued employee or business owner. REMEMBER: Spreadsheet Gurus are always asking the question, "Is there a better, faster, more accurate way to do this?" Below are a few awards this website has earned recently. In congruence with this website, I also actively write an email newsletter that is geared more towards sharing productivity tips and tricks. These (typically straightforward and brief) emails contain strategies you can use to create awesome Excel files that run efficiently and output your data in ways that will blow your manager's mind! These are processes that I have created and tested and now have VPs and managers three to four levels above me asking for advice on the best way to setup their data analysis. These emails are completely free and will help to benefit your career in the long run. Signing up not only gives you access to my most meaningful tips, you also can download any of the examples files shown in my articles to help you better understand the tutorials. You can quickly subscribe by clicking the green button below. Using an RSS feed reader is a great way to keep track of all the new articles that are posted to any website you frequently visit without having to actually go out visit that site. I recommend either using Feedly or Digg Reader as they are both great readers (I currently use Feedly). My style of writing and teaching follows the KISS methodology: Keep It Super Simple. I will try to stay away from fancy computer terminology and will try to write my posts as if I am speaking to a brand new user with no previous knowledge on the subject matter. I ask you to ask any questions you have on my posts and also to add any comments you think will benefit others in the future on the posted topic. I will try my best to make my articles reflect accurate and efficient ways to cover the posted topic. Keep me honest, and together we can make this site a great resource for everyone!